Seagate has introduced its second-generation of helium-filled HDDs. These drives will be aimed at capacity-demanding enterprise and cloud applications, and the new drives store up to 12 TB of data. The new drive uses eight platters, which is more than the first generation model, but its power consumption remains below typical air-filled HDDs. The new capacity point from Seagate should enable customers to increase the amount of data they store per standard rack by 20% when compared to previous-gen models. The Seagate Enterprise Capacity v7 3.5-inch HDDs are based on the company’s seventh-gen enterprise-class platform, with multiple features designed to reduce the number of errors, as well as reducing the vibration impact on internal components and improving the security and the endurance of the device. Traditionally such drives have more robust mounting mechanisms for internal components anyway, such as the motor, and various vibration and environmental sensors to guarantee predictable performance and reduce risks. In addition, the new HDDs support PowerChoice technology that helps to manage idle power consumption. The new PowerBalance tech enables operators of datacenters to balance power consumption and IOPS performance of the hard drives. When compared to the previous-gen Enterprise Capacity HDDa, the new ones support RSA2048-signed firmware with a secure download and diagnostics (SD&D) feature that prevents unauthorized access, modification or installation of a tampered firmware. The new Enterprise Capacity v7 3.5-inch 12 TB HDD has eight perpendicular magnetic recording (PMR) platters, each with a 1.5 TB capacity. This comes with 16 heads, and rotates at 7200 RPM. Cache is listed as 256 MB for each drive. Due to higher areal density and some other optimizations, the new-gen enterprise HDDs have up to a 261 MB/s maximum sustained transfer rate, which is a little bit higher than the helium-filled drives introduced last year. The random write performance of the new drives is also slightly higher when compared to that of their predecessors (it's still worth noting that 400 IOPS is behind that of even entry-level SSDs by orders of magnitude). Moreover, despite the addition of a platter, the maximum operating power of the new Seagate Enterprise Capacity Helium HDDs seems to be similar when compared to that of the first-gen helium hard drives, at around 8 W - 9 W (see the table for details). At the same time, the average idle power consumption of the new HDDs is slightly higher when compared to that of their predecessors. 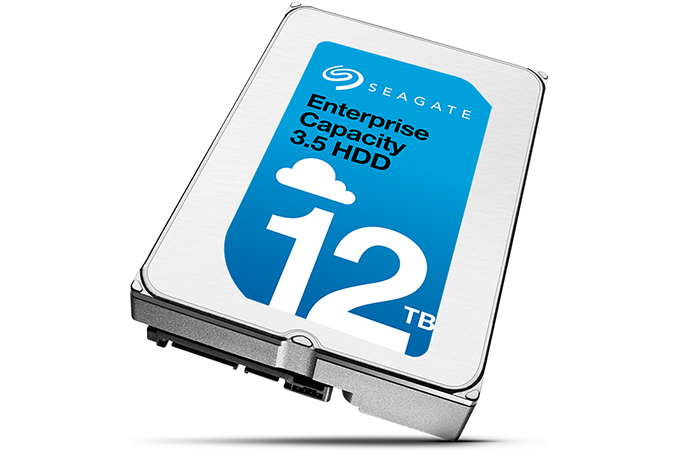 The family of Seagate’s 12 TB Enterprise Capacity 3.5 HDDs includes 12 models with SATA 6 Gb/s or SAS-12 Gb/s interfaces, 4Kn or 512e sectors, self-encrypted drives (SEDs) as well as SED-FIPS HDDs. All of the hard drives are rated for 2.5 million hours MTBF and come with a five-year warranty. Seagate is expected to start shipments of its 12 TB HDDs shortly, but pricing is unknown. most external drives have a separate board for the usb to sata bridge, this allows them to use the same case and bridge and then just change the drive for the different sizes, thats why if a external drive fails just take it apart and pull the drive out and hook it directly to the computer to see as it can sometimes just be the usb sata bridge that fails.